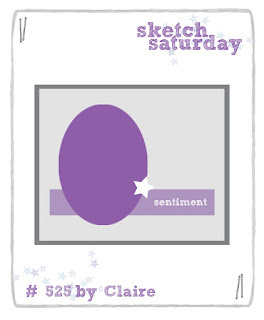 I'm so tickled to be a Guest Designer at Sketch Saturday for the whole month of August! 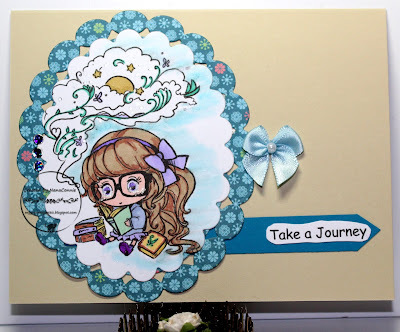 Our sponsor for this sketch is Star Stampz and "Journey through a Book" is one of their images. I love sketches for inspiration and Sketch Saturday has some of the best ones. Let me show you my card and the sketch. I colored with ProMarkers and the 'sky' is done with watercolors. Both the image and frame are cut with dies from Spellbinders. The sentiment is printed and hand cut, then layered onto the CS flag. I used one of my signature bows which was originally white but I used a ProMarker to 'dye' it. Finally, I added three tiny gems to the left hand side of the image but they're hard to see in the photo. All the paper/CS on the card were scraps left on the craft table from other projects. Beautiful image on this gorgeous card my friend, love your interpretation of the sketch too. Thank you so much for entering the Anything Goes challenge at The Outlawz Challenges this week. Looking forward to seeing you again in our next fun challenge. Perfect sentiment for that cute image! Thanks for playing along in this week's challenge over at The House that Stamps Built! Love your scalloped frame and image, so sweet! Fun sketch! LURVE your card and a GREAT Congrats for being GDT. Super cute! I really like the scalloped ovals, they add to the dreamy or other-worldly feeling of the image. Thanks for playing with The House That Stamps Built. This is so beautiful!! The image is so sweet!! I love the colors!! Thanks so much for playing along at Scrapy Land!! Fabulous card, love the image and the sentiment is just right! Thanks for sharing with us at Aud Sentiments.